Docker takes a slightly different approach with its network drivers, confusing new users which are familiar with general terms used by other virtualization products. If you are looking for a way to bridge the container into a physical network, you have come to the right place. You can connect the container into a physical Layer 2 network by using macvlan driver. If you are looking for a different network connection, refer to my docker network drivers post. Before I begin, you should check some basics on what macvlan is, why it is a better alternative to a linux bridge and how it compares with ipvlan. Important: As of Docker 1.11 macvlan network driver is part of Docker’s experimental build and is not available in the production release. You can find more info on how to use the experimental build here. If you are looking for a production ready solution to connected your container into a physical Layer 2 network, you should stick to pipework for the time being. Last but not least, macvlan driver requires Linux Kernel 3.9 or greater. You can check your kernel version with uname -r. If you’re running RHEL (CentoOS, Scientific Linux, …) 6, you’re out of luck, upgrade to RHEL 7. You should be fine with your updated Ubuntu. Being IPv6 aware, all the configuration examples are dual-stack. If you have no desire or means to provide native IPv6 connectivity, simply omit all IPv6 configurations which I kindly marked in italics. First, make sure you’re a root or have superuser permissions. eth0 is up & running, it has both IPv4 and IPv6 address, so you’re good to go. Create a new macvlan network called macvlan0. Why do you have to configure both L3 subnet and default gateway if macvlan promises to deliver an L2 network? Surely IP configuration of the containers in the macvlan network is dealt separately, either with the static configuration or by the external DHCP server? Unfortunately – no. Docker controls the IP address assignment for network and endpoint interfaces via the IPAM driver(s). Libnetwork has a default, built-in IPAM driver and allows third party IPAM drivers to be dynamically plugged. On network creation, the user can specify which IPAM driver libnetwork needs to use for the network’s IP address management. For the time being, there is no IPAM driver that would communicate with external DHCP server, so you need to rely on Docker’s default IPAM driver for container IP address and settings configuration. Containers use host’s DNS settings by default, so there is no need to configure DNS servers. If you absolutely need your containers to acquire IP data from the DHCP server, macvlan driver is currently not the solution you are looking for. Use pipework. Warning: You should not have an external DHCP server assigning IP addresses for the same subnet you have configured at the creation of the macvlan network. Docker’s IPAM driver is not aware of the IP addresses already in use by external DHCP clients, leading to possible IP address conflicts in the subnet. You have just created a network that uses macvlan driver on parent interface eth0. It uses default IPAM driver with one IPv4 and (optionally) one IPv6 subnet. No containers are currently connected to the network. container0 has one interface, connected to the macvlan0 network. Use --detach=true to run the container in the background. Note that network now has a container attached. IPAM driver ensures the container got an IPv4 and an IPv6 address from the subnets configured for the macvlan network. Ping will fail. While containers utilize the parent physical interface of the Docker host to reach the outside network, they have no direct connectivity with the physical interface. 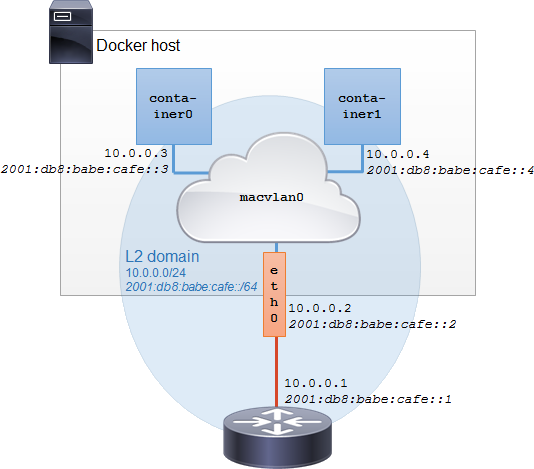 If you need direct connectivity between the container and the docker host configure a macvlan subinterface on the host, or use a different docker network type. Finally, check the ARP table on the router. After all the pings performed, it should have the entries for the docker host IP address (mapped to the host’s physical NIC MAC address) and both container IP addresses (mapped to containers’ virtual MAC addresses). Congratulations, you have just connected two Docker containers into the physical Layer 2 network using the macvlan network driver! I’m trying to make some tests on docker/macvlan setup to be able to have in/out traffic between containers and the external network. But no way to communicate with the external network …. PING 192.171.40.1 (192.171.40.1) 56(84) bytes of data. I’m completely stuck here, it seem a simple case ! I found a remark saying that there is no connection possible from the docker behind a macvlan and the external network?!?!? Did you get this to work? I would like to have access between my containers (on macvlan) and my container host. I would rather not switch to another container networking option. Are you able to explain (or point me to a URL) that details what you mean by configuring a macvlan subinterface on the host.